When the spring sun has begun to warm the winter cold salt water, it’s not only you that begin to feel the effects of spring. 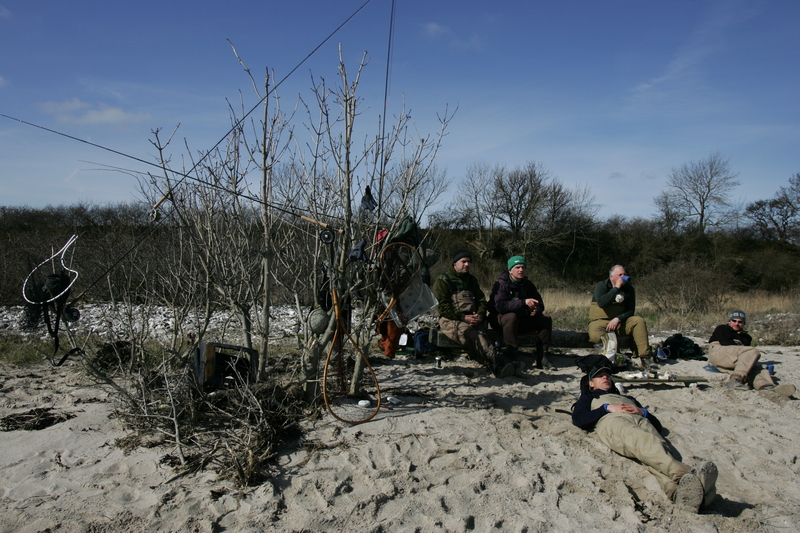 The coastal sea trout that have gone the whole winter in energy saving modus, are now ready for the spring feast. 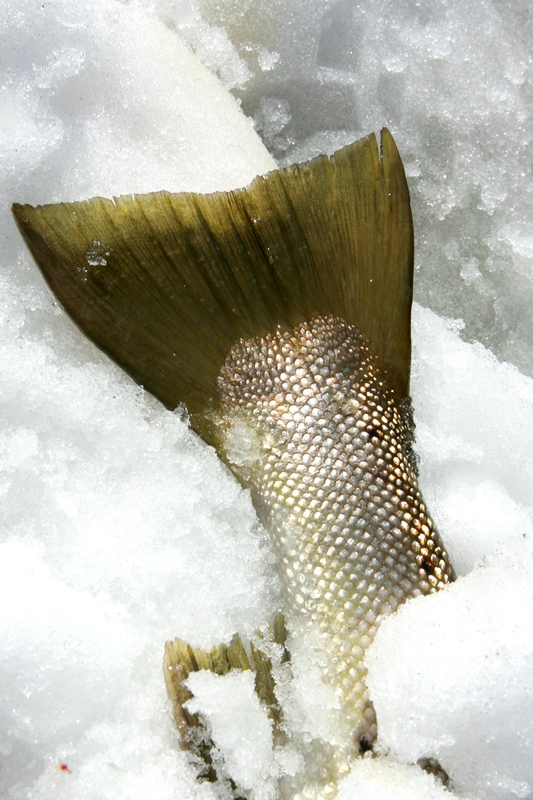 For most of the coldest part of winter the sea trout are as little active as possible and hold to areas that are warmest. 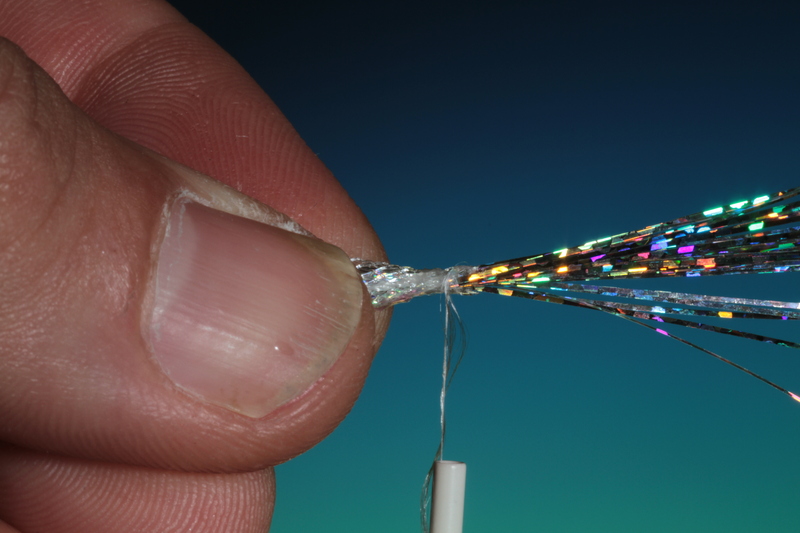 They can be difficult to tempt on regular fly fishing equipment, but a good colorful large streamer, fished slowly can work a winter fish up. Right now when the water temperature begins to rise, they will become much more active in their pursuit for food. The sea trout is an aggressive predator and during spring and early summer has a need to fatten themselves up after winters fast. This is why they are best to fish for now. But you are still not guaranteed success, even if the sea trout is hungry and hunting. 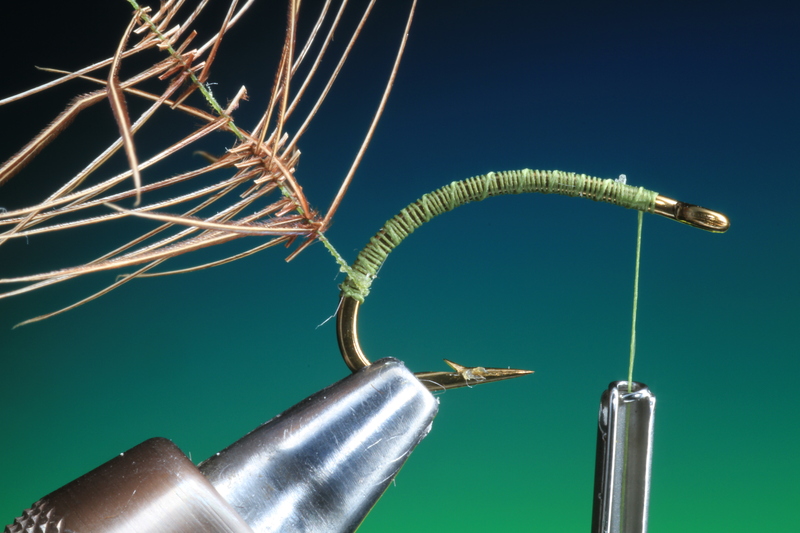 So I have put together a few tips -that work- for you that wish to fish for sea trout from now into the summer. 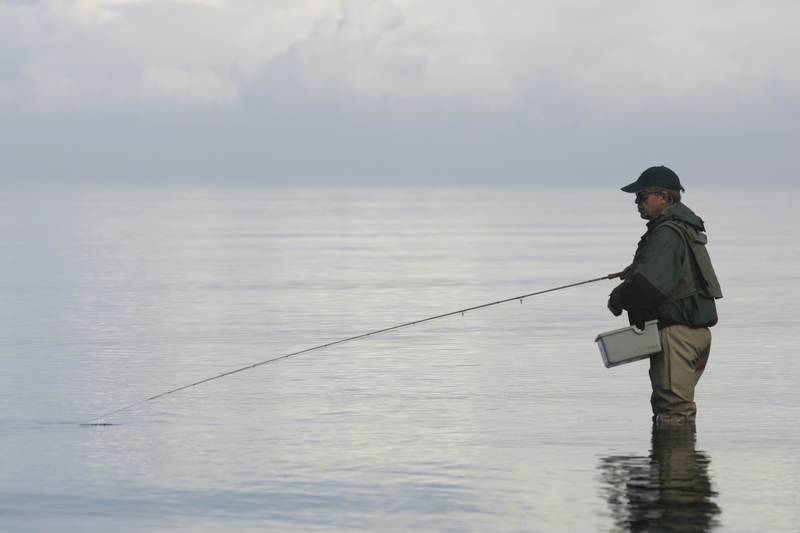 Success for sea trout fishing relies on finding the fish. 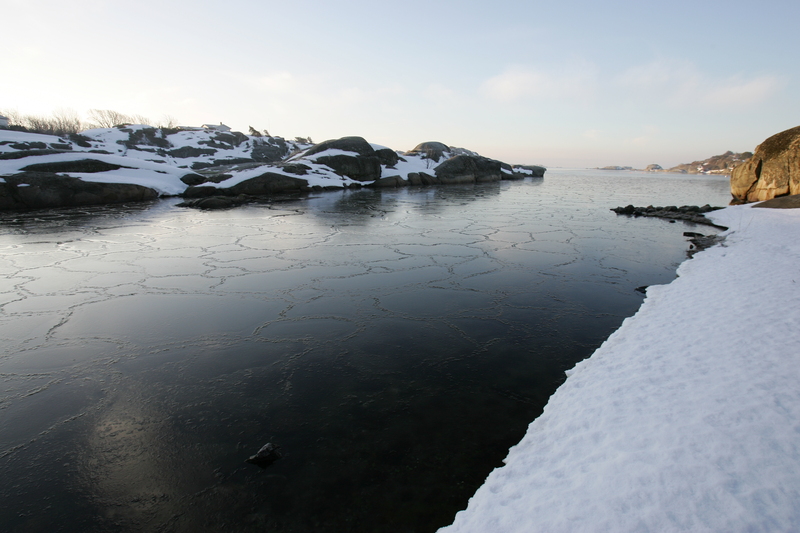 And in the winter and spring you have to look for warmer water, 4 degrees or more. If it is 12 or 14 degrees in the water in June it makes little difference for the sea trout, but in March-April 4 degrees is much warmer than 2 degrees. 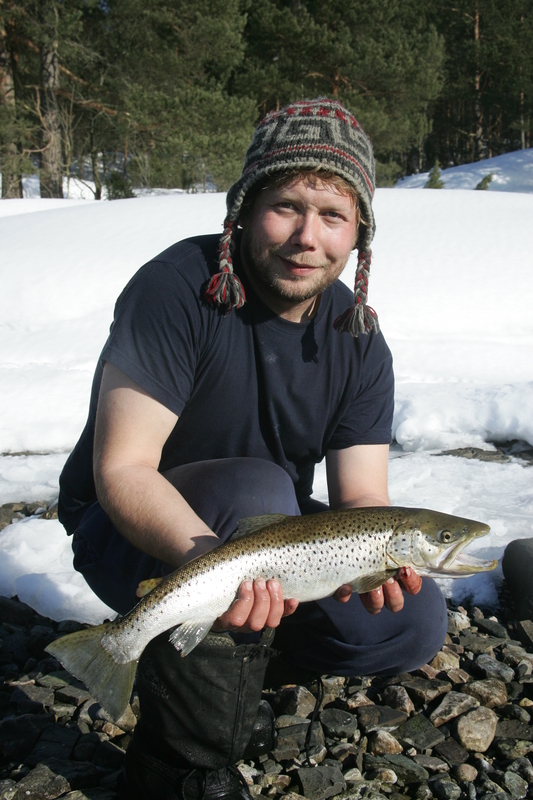 It doesn’t need big changes in temperature to get the sea trout going. Shallower south facing, sun rich bays and beaches with a flow in the water. Here it doesn’t take much more for the sea trouts menu to awaken from the winters sleep. 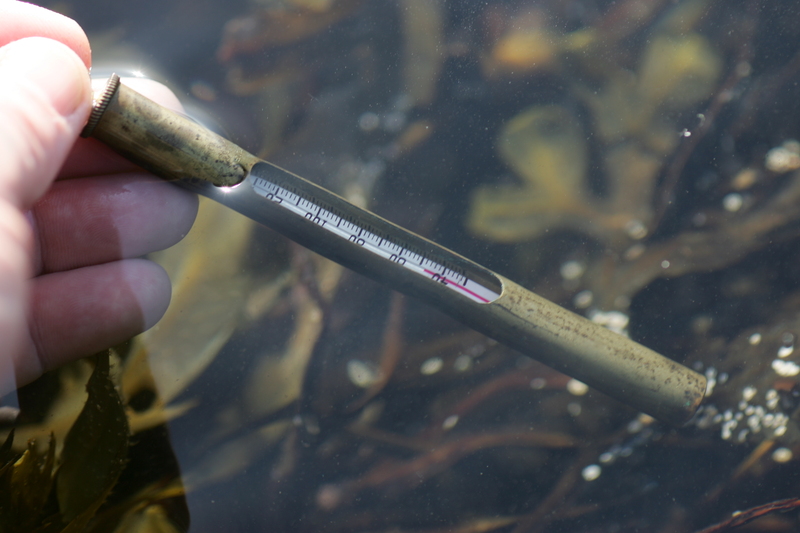 Because the temperature is important a thermometer is also important for the serious sea trout fisherman. 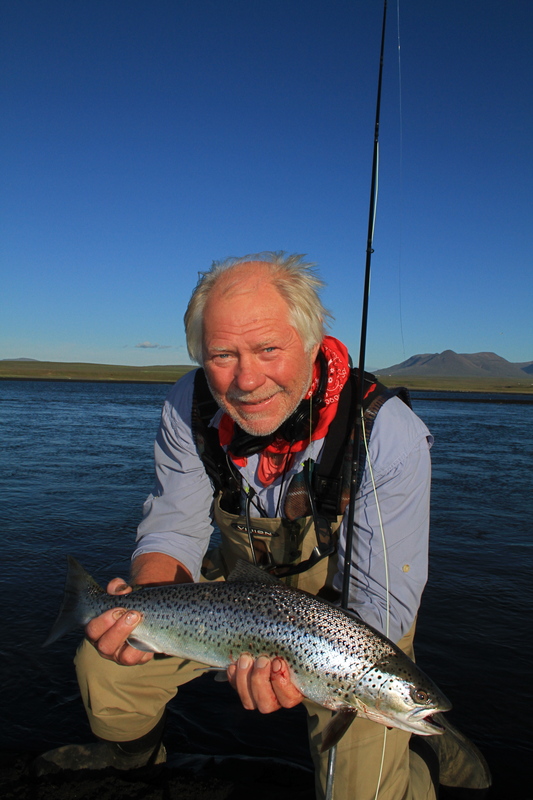 If it is an extra cold, spring brackish water areas generally hold fish, because the salt content of the sea here is smaller, the sea trout like this ! 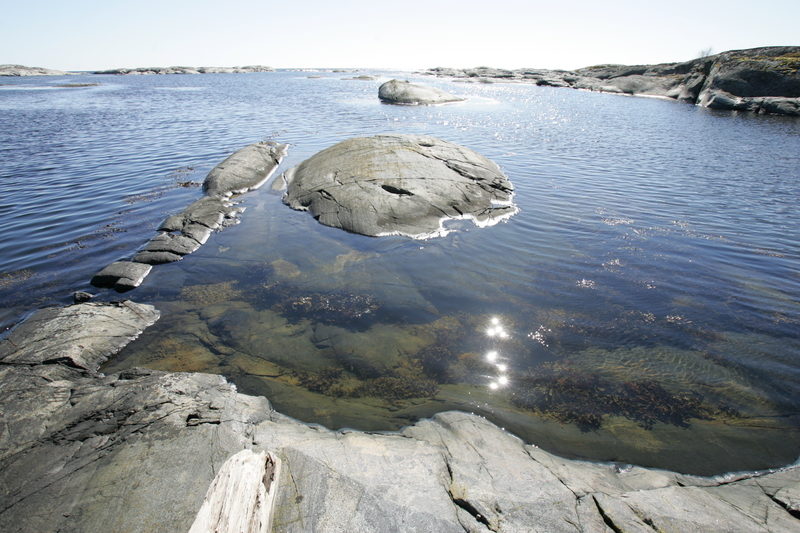 Also look for structure in the water large stones islands or cliffs. These structures collect and store heat from the sun, this will warm the surrounding water. We don’t know the reason why, but in some cases you can experience fantastic fishing just on the edge of frozen water or floating pack ice. But in most cases it’s small fish, that should be returned that are in shoals. The rag worms wedding as it is known, is called the springs most exciting adventure for the sea trout fisherman. And if you are lucky enough to be at the right place at the right time, there is no danger for you not connecting. 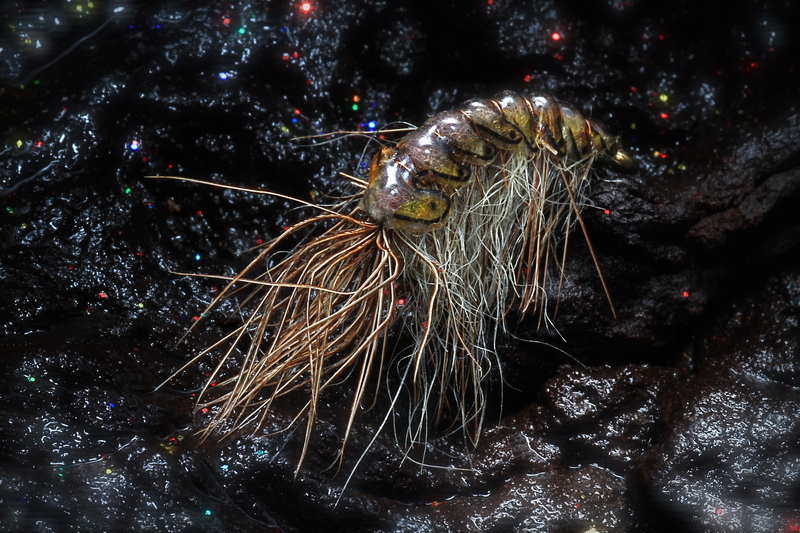 You can find rag worms the whole year in the stomach contents of sea trout, but in the spring under large swarming you can find that they fall out of the mouth of the sea trout that have gorged themselves, when you land them. When doe’s the swarming happen ? 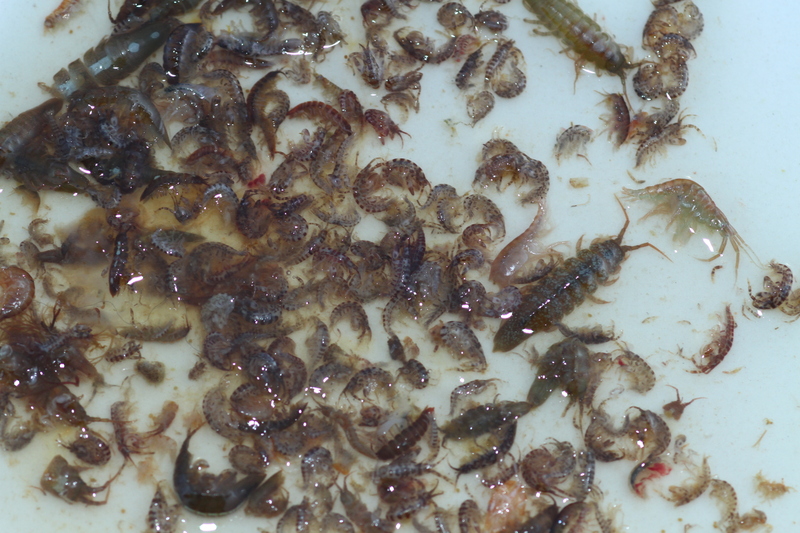 The chances of experiencing a large swarming are best after the water has gone up in temperature above 6-7 degrees and around the full moon in April, but this is not a fast rule, and last year we experienced swarming, during a warmer day on a full moon in early March. Rag worm swarming can be very local in most situations, and it’s not easy to know where. 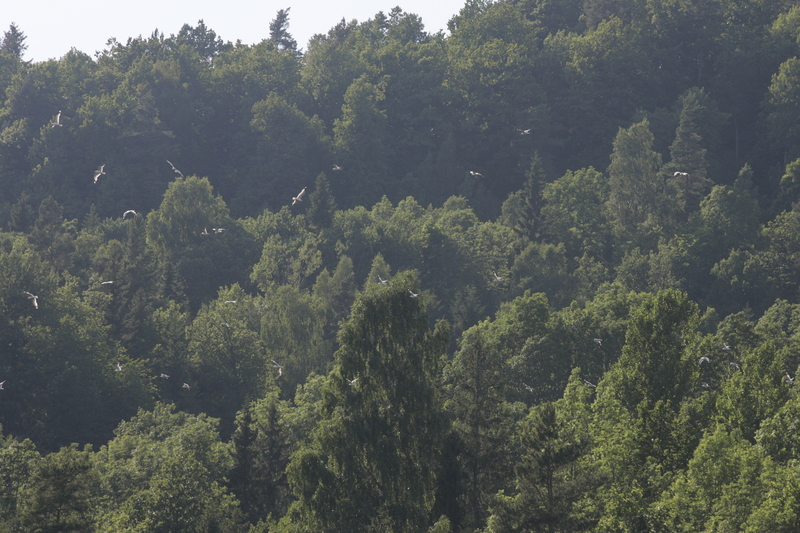 Then you should look to the sky’s, because the greedy and forever hungry sea gulls can show you the way. If you can see that screaming sea gulls are in a flock and circle around a area of coast, this shows you where to fish – just like the pelicans when tarpon fishing. 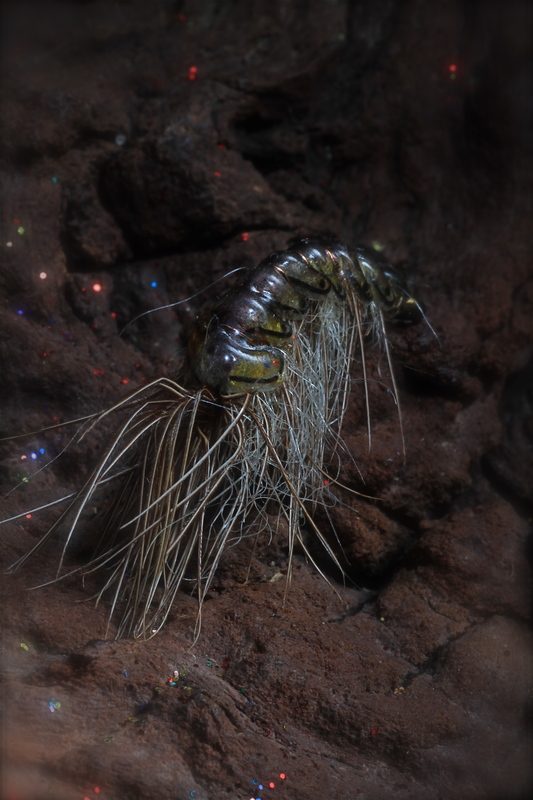 Think that the sun has been high in the sky all day and warming up the shallow’s, especially with dark muddy bottoms. These shallow areas retain the days heat during the first couple of hours of darkness. 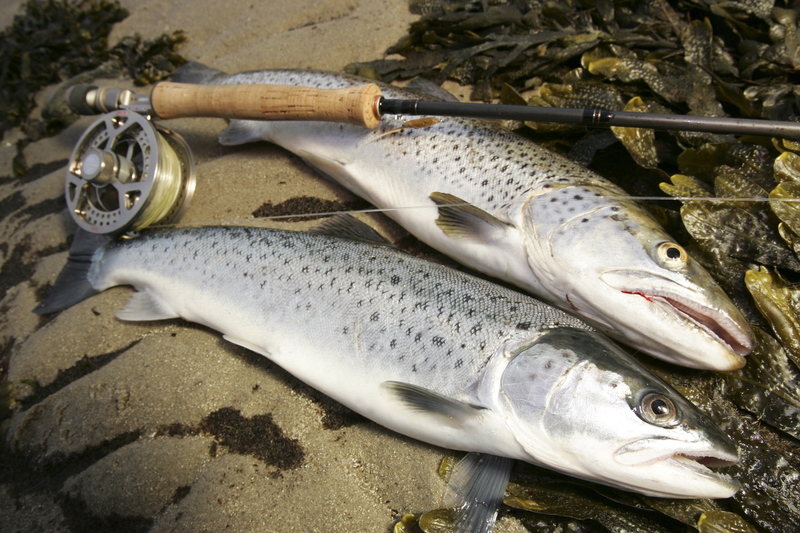 It’s during this period that larger sea trout dare to venture into the shallows to feed. You should fish at least a couple of hours into the night. 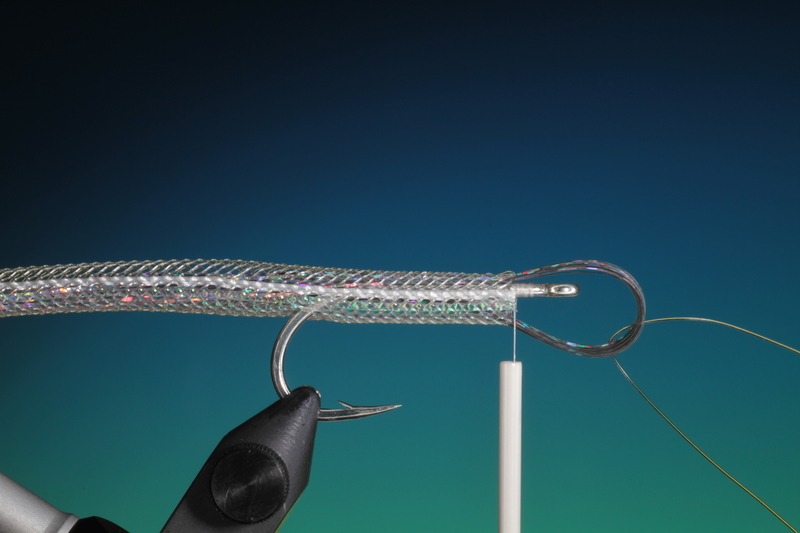 Try using streamers or Muddlers that will give a little movement in the water. Fish slowly and listen for splashes. 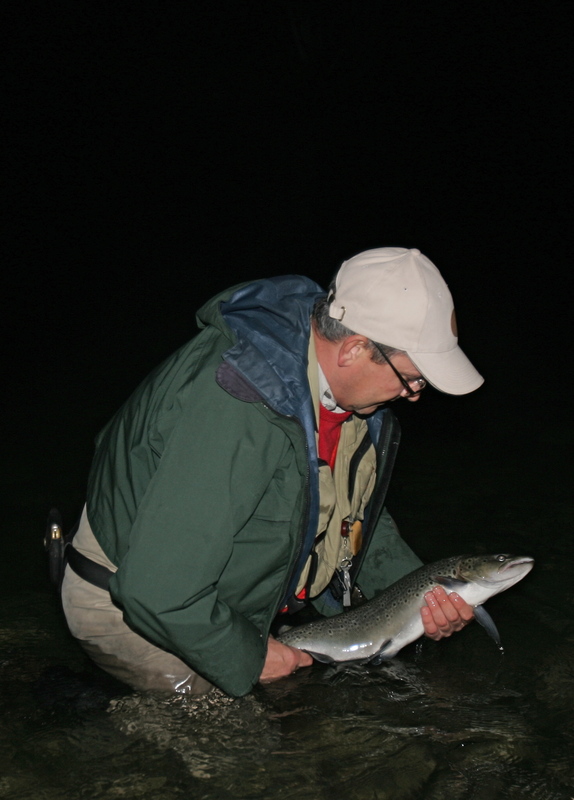 During darkness, night or early morning sea trout hunt in much shallower water than most fishermen think. 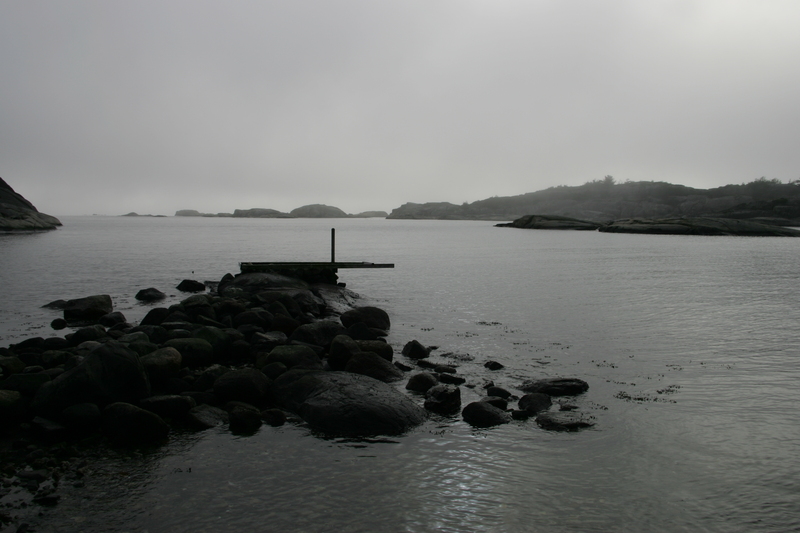 In small bays and harbors, rocky shoreline and long shallow beaches. Here you can encounter fine fish in water not deeper than you need nothing more the rubber boots. But remember in such water they are also spooked easy. When is the best time ? 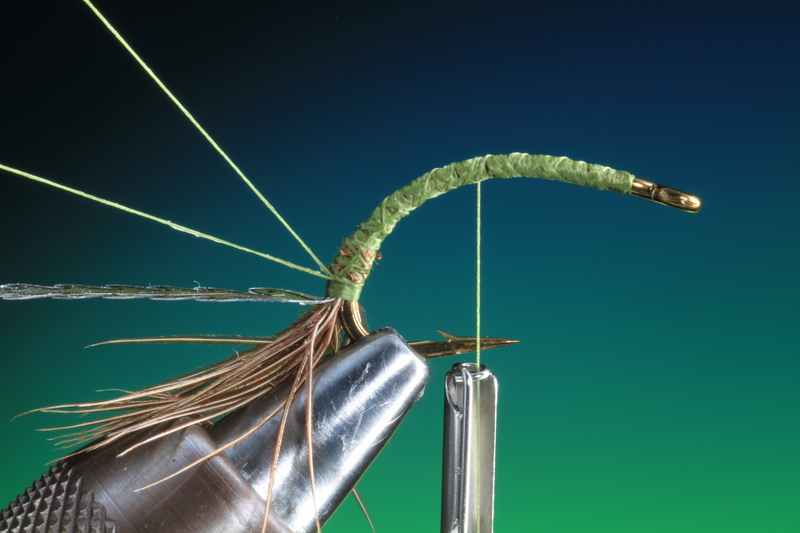 There are many different thoughts about the best time to fish for sea trout. The best advice is to fish when you have chance to fish. Those that fish the most catch most fish and get the most experience. 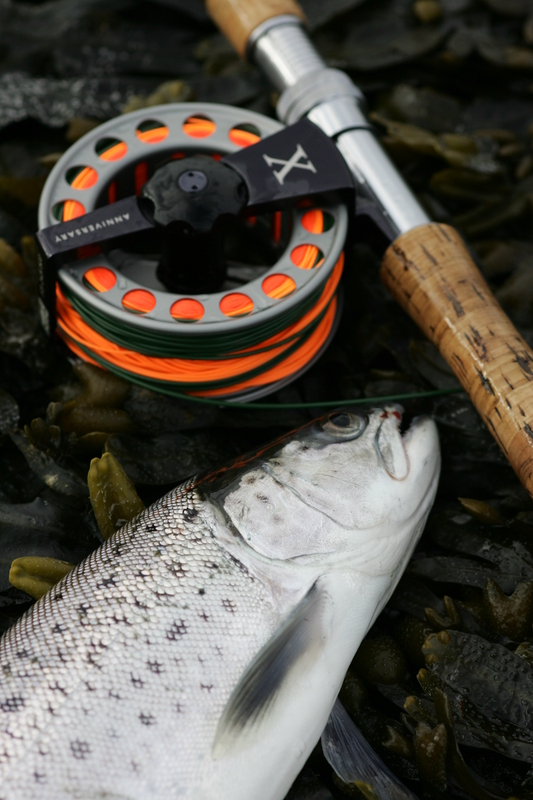 The sea trout is effected by the moon and it’s fases, and some times fishing can be best on a spring tide, and other times in periods with extreme low water in the high pressure periods you can experience during late spring. There is also many thoughts about this, if fishing is better at high or low tide in the sea. 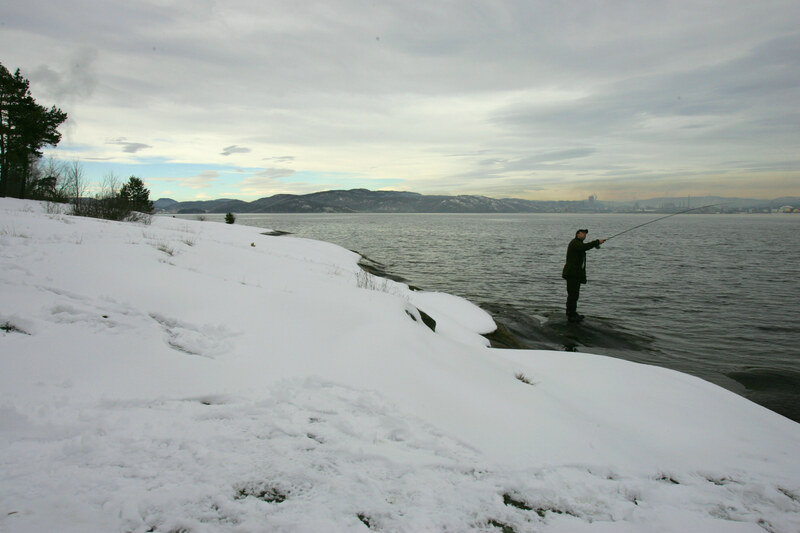 During winter it’s most rewarding to fish at the warmest part of the day, between 11:00 – 14:00, no matter high or low tide. When the water warms, in most cases it’s best to fish a couple of hours before high water into a couple of hours after. When is high and low tide ? From early April it can prove to be rewarding if you fish early in the morning. Early means a couple of hours before sun rise, so you must have a alarm clock and a good dose of self discipline. 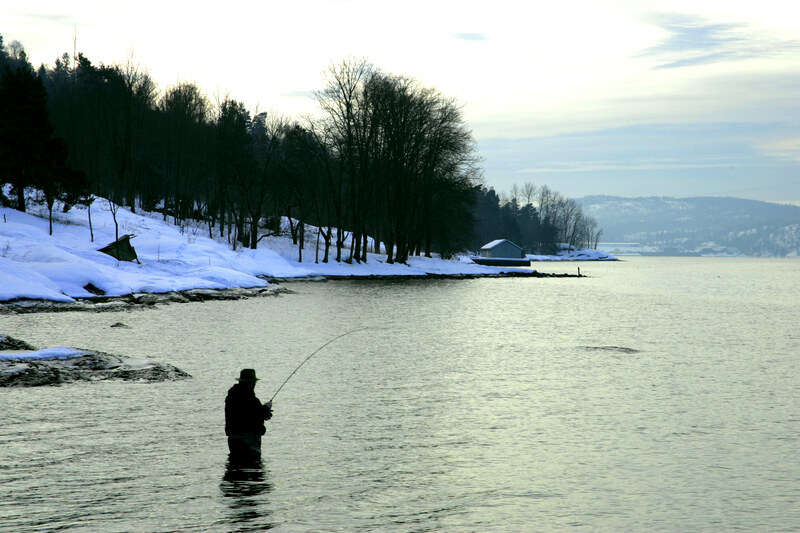 Even if it is cold, you may be lucky enough to find large sea trout who cruise shallow water after being out hunting at night. If you are not a early bird by nature, you can also try your luck from the end of March into April between 19:00 – 23:00 especially if you have high tide within this time period. And so it will continue out towards the summer, but try fishing in deeper water with flow in it. 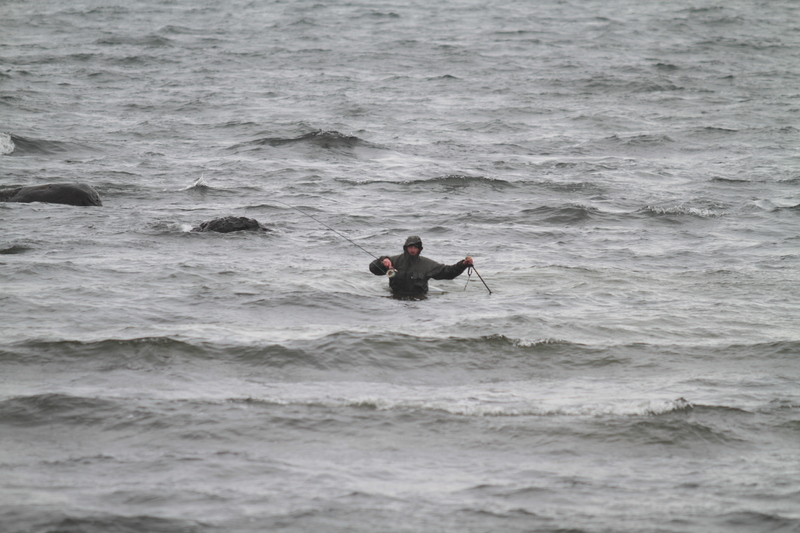 Even if warm is the key word with sea trout fishing in the spring, fishing can fantastic in bad weather. Don’t look out the window and decide to stay home because it’s blowing and raining. Under the cover of bad weather and high waves shy and big fish come into the shallows to feed. This type of weather can be a fishing fest for spin fishermen. 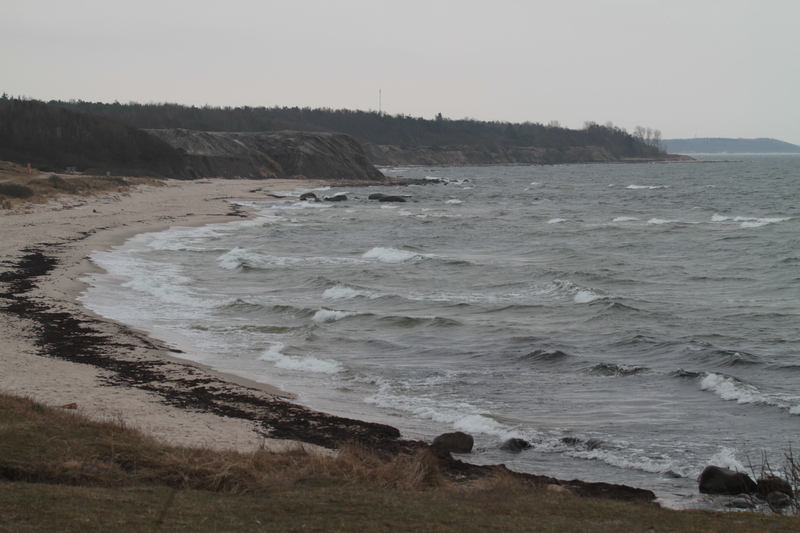 When the wind blows from the sea against the land all the food in the top few meters of water will blow towards land and collect near the shore. And where there is most food, there are sea trout. This wind direction produces the best fishing. Use a fine clear line or leader on clear sunny and wind still days. 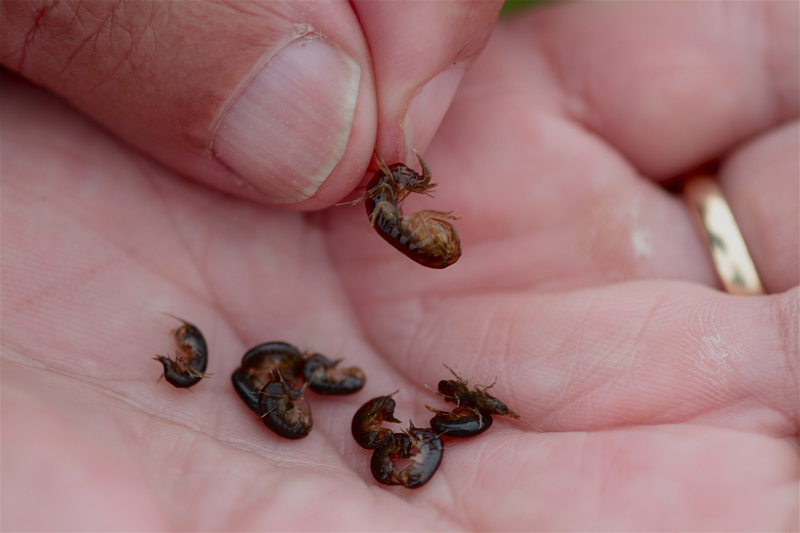 Smaller flies also produce more fish in good weather. 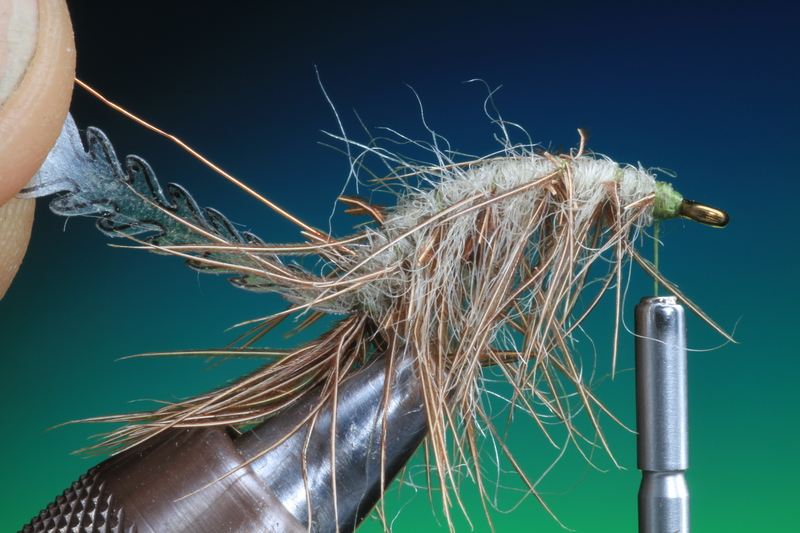 Sometimes sea trout can be selective on such days, where only the very smallest flies will work. 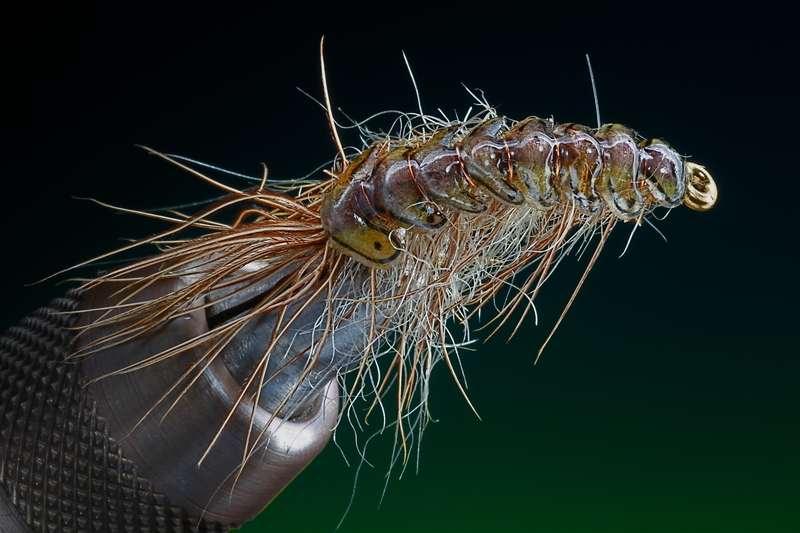 This is when only fly fishing will work, with tiny flies 16-18 and a long fine leader and very slow retrieve. Start fishing before you come down to the waters edge, and for no price begin to wade before you have fished the shallows thoroughly. 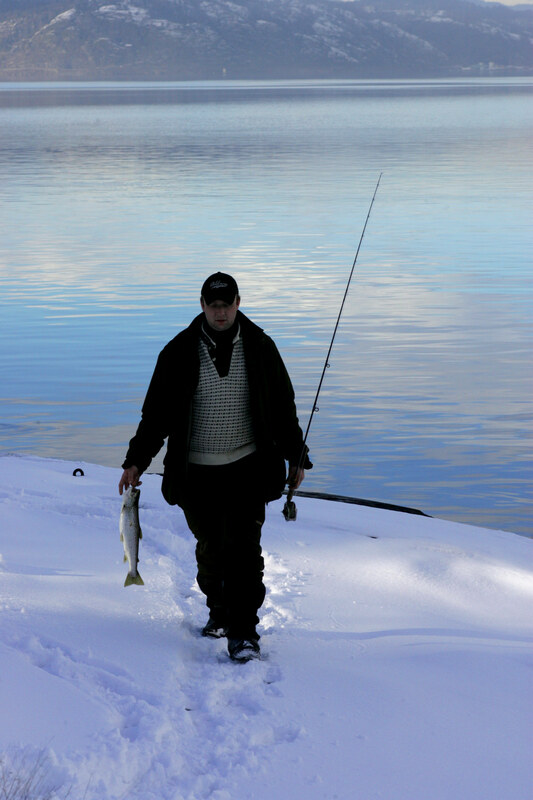 It doesn’t matter what you fish with, a rule of thumb is, slow in winter and through out spring. 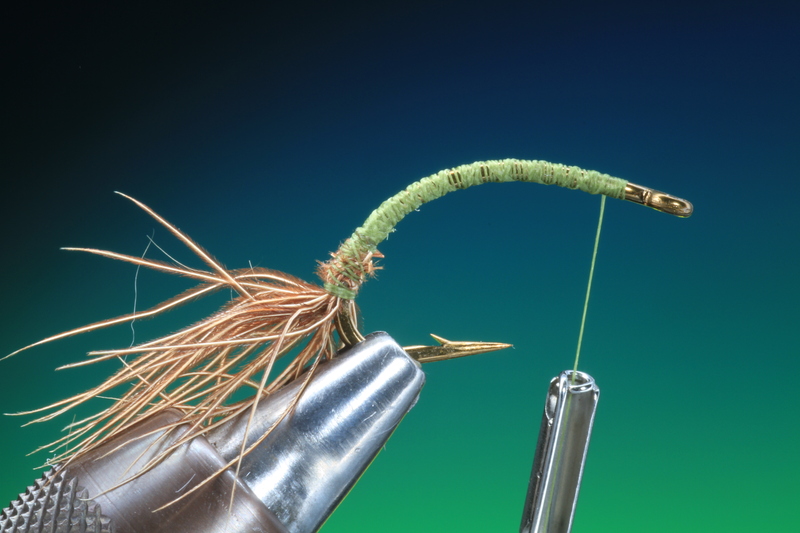 It’s here that fly fishing has the edge, use a very slow figure of eight retrieve. 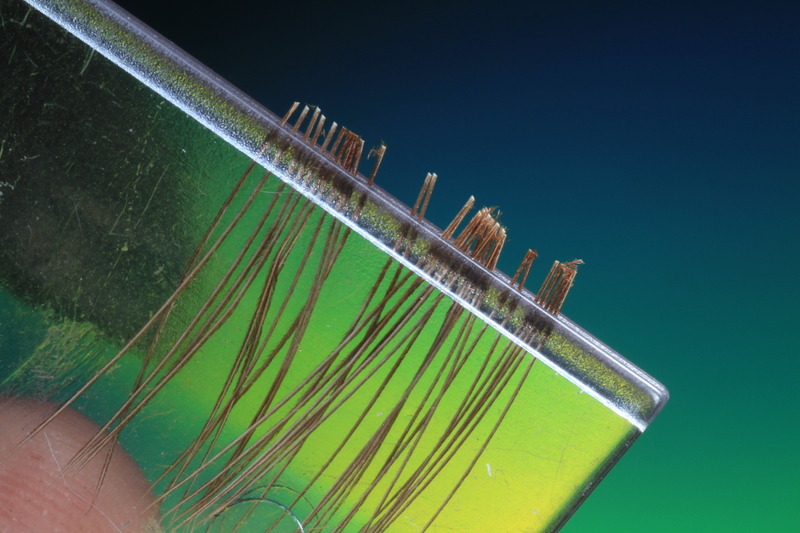 Even if the rule is slow in cold spring water, you can experience that the opposite is more effective. 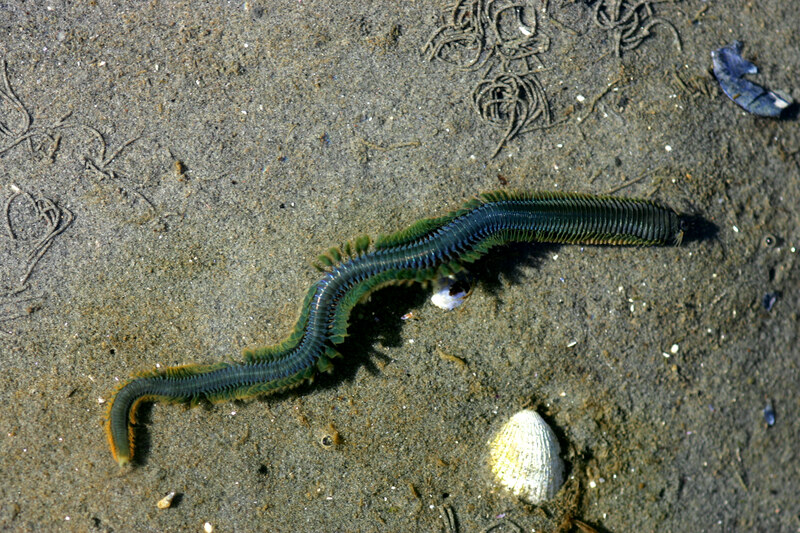 For example: a rag worm should be fished slowly, so that it swims like it’s flowing in the water. 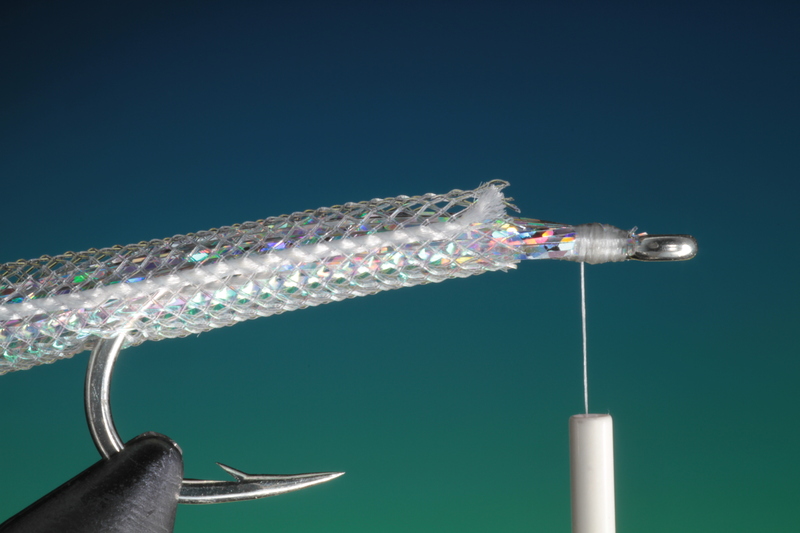 If you experience that fish follow and will not take, it some times works if you place your rod under your arm and make a “roly poly” retrieve using both hands. The best rule is try what is the norm, then try to vary your retrieve until you find what is right. Don’t pull your spoon or fly out of the water when it is 5-6 meters from land. 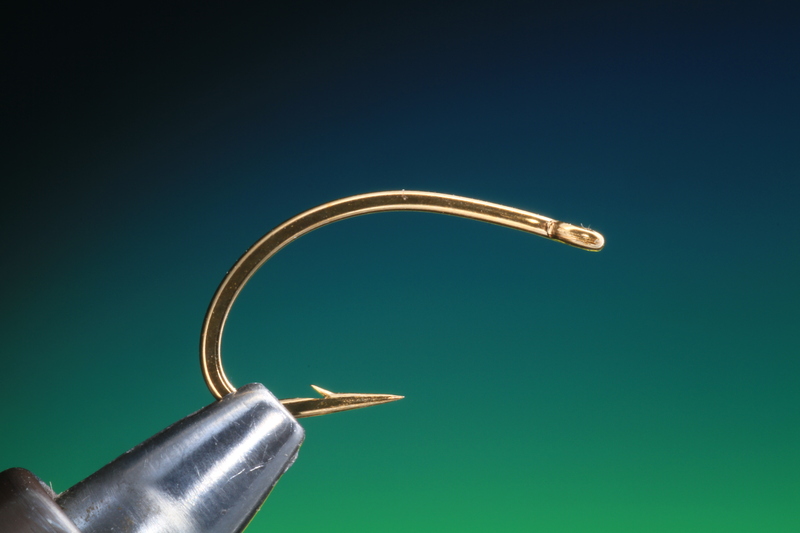 You will get much better results if you fish your spoon/fly all the way into land. 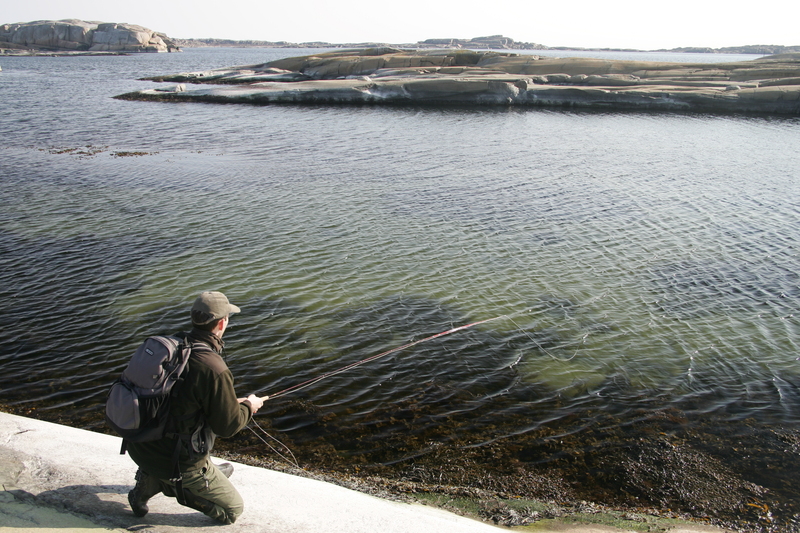 Sea trout like to follow the bait a few meters before they take, and the very last meter is the most dangerous for the sea trout. 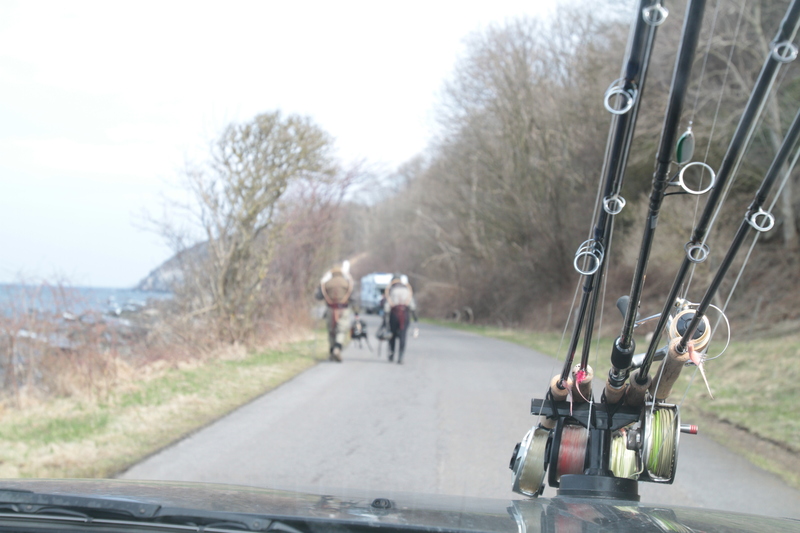 Its said that the most important piece of equipment while sea trout fishing is the car! Trout in a river are like trout eating at a restaurant, they sit and wait for the food to come to them. Sea trout on the other hand race from restaurant to restaurant. 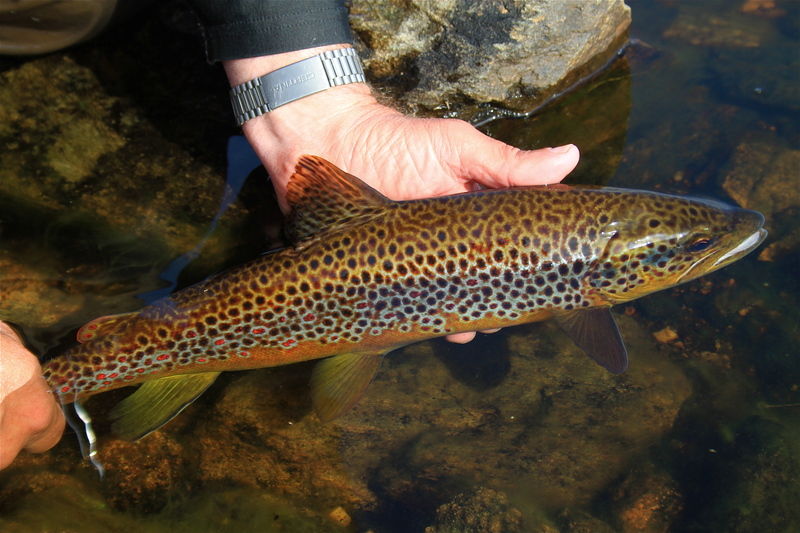 Especially in the spring months the sea trout is eating on the move. If you dont find fish move a little. If you dont find the sea trout, let the sea trout find you! Take many breaks while out fishing, make sure you have coffee with you and something to eat. While you sit and take a break, dont take your eye’s off the water it’s now you may spot the rise of a passing sea trout, or a silver flash from the side of one hunting. 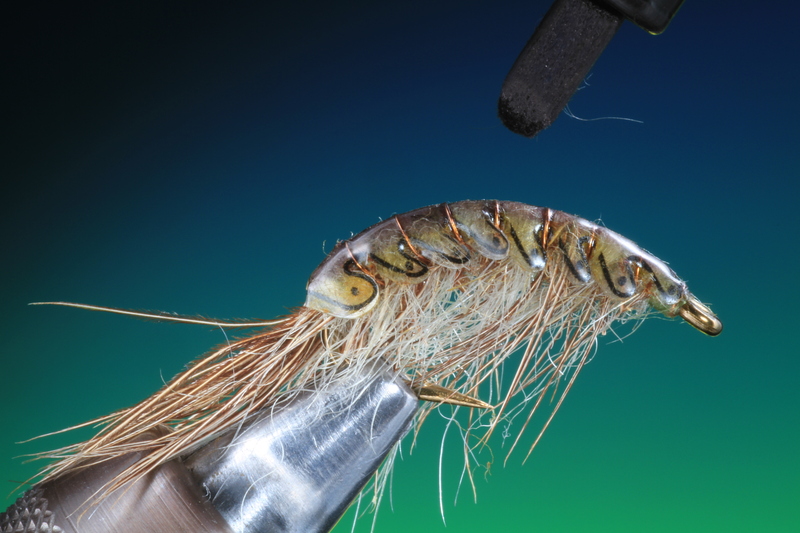 If you really want to catch more and bigger sea trout, there is only one expert tip that is 100% guaranteed to work, “Dont give up” even if you are not catching. The more you fish, the more you will catch! 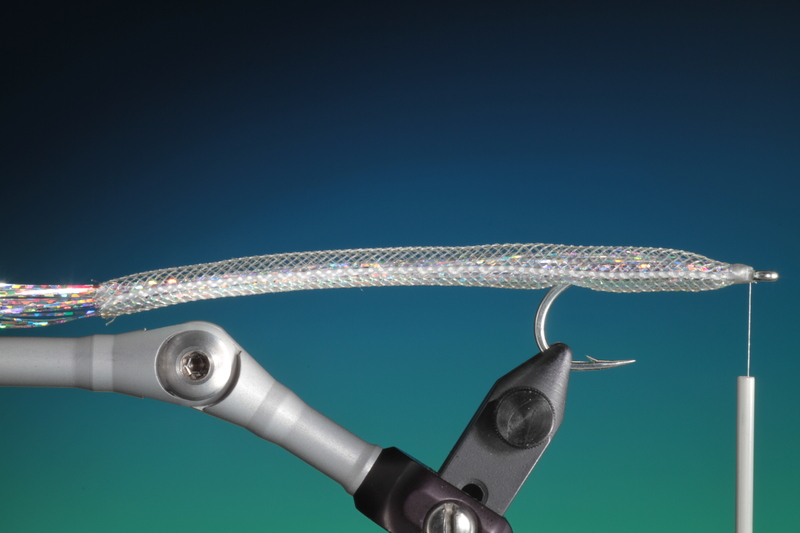 A great pattern for salt water sea trout and Sea Bass. The original pattern this is based on is form the vice of my late, old friend Jack Gartside. 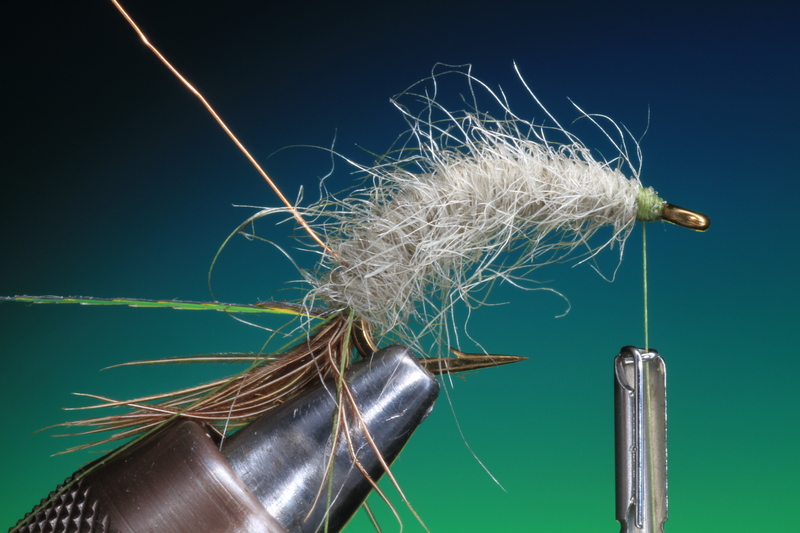 This is not only an extremely effective pattern but also requires the minimum materials and once you have mastered the technique is very quick to tie. 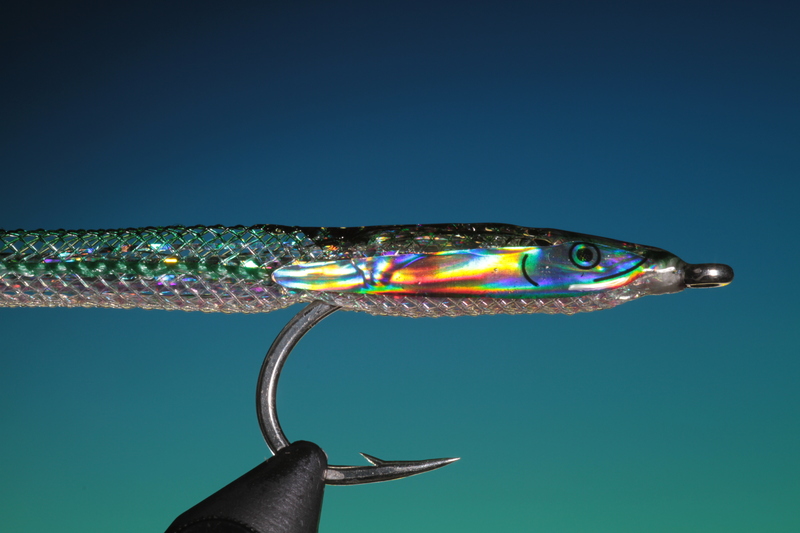 Like the most effective coast wobblers that represent Tobis this pattern is a darter, and has next to no movement in the materials, but like a fleeing sand eel it “darts” in a short fast “zig zag” movement. 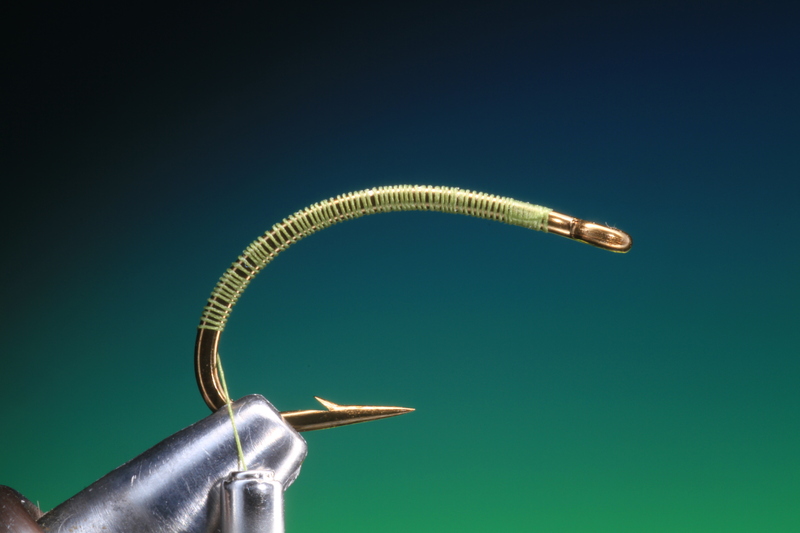 Another “problem” for many fly fishermen is that the hook on this pattern is mounted at the head of the fly, leaving a good length of body for the sea trout, sea bass to bite at without being hooked. 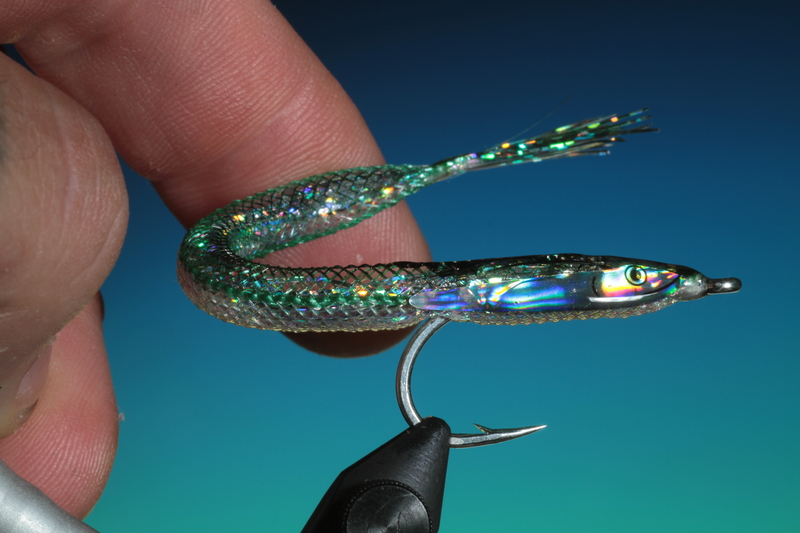 This can be the case with smaller fish but larger fish tend to take this pattern contant. Also a interesting little experiment that I have undertaken a few times is, if you are cleaning a fish that you see has been feeding on sand eels just have a look at which way the head of the sand eel is facing in the stomach of the fish, nearly always, has the sand eel been swallowed head first! 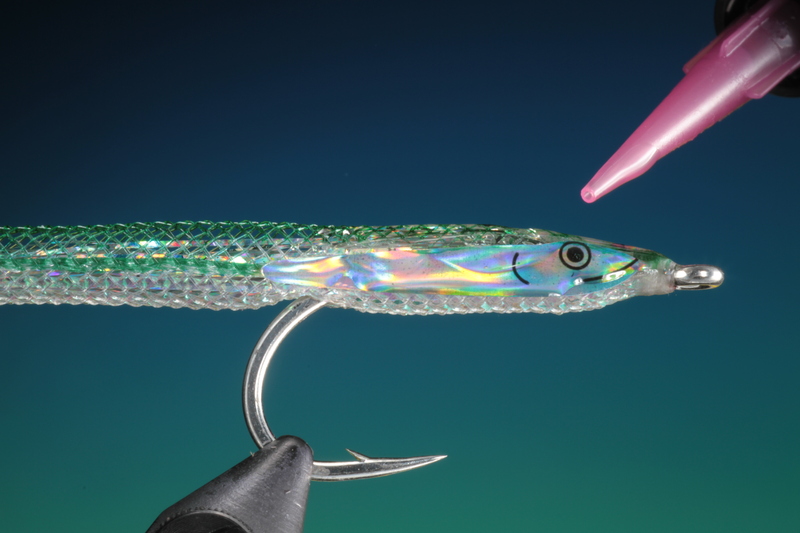 The attach point for pradatory fish is the eyes and these new Fleye foils from Bob Popovics make very realistic sand eel and bait fish patterns. Sand eels shoal in very large numbers, but are seldom seen during the day in the shallows as they lie buried in the sand, away from predators. They first appear during the evening, when they come out to feed through the night. 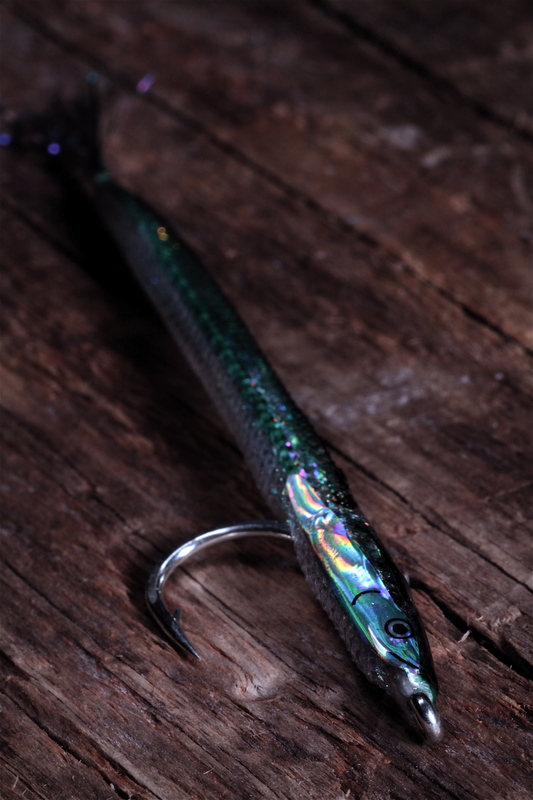 But despite there nocturnal habits sand eel patterns can be fished around the clock the whole year. You can also try other colour combinations, but keep in mind the general rule of the lightest colour on the stomach and the darkest colour on the back. 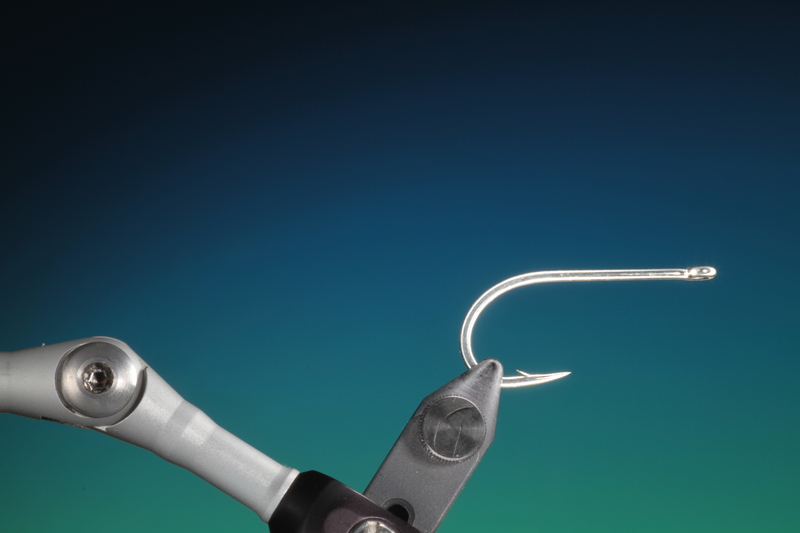 Secure your salt water hook in the vice. 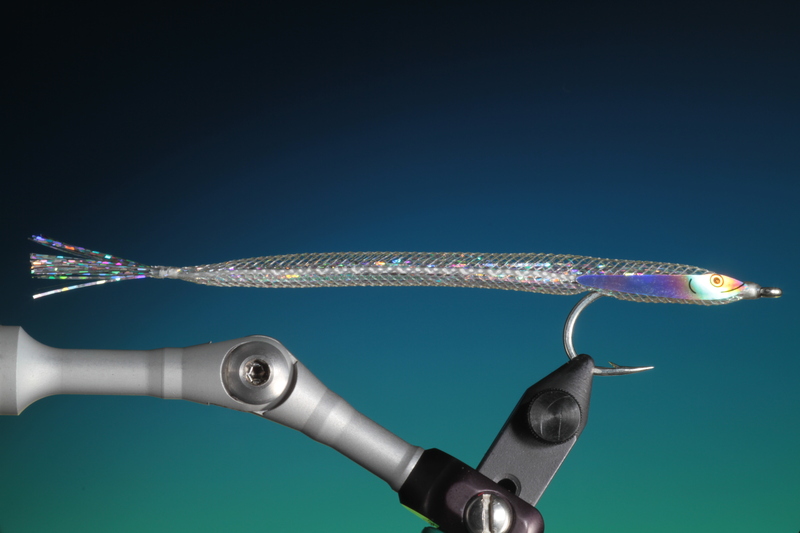 I like to use a Mustad C70SNP Big game light for this patter beacause of its wide gape and short shank. 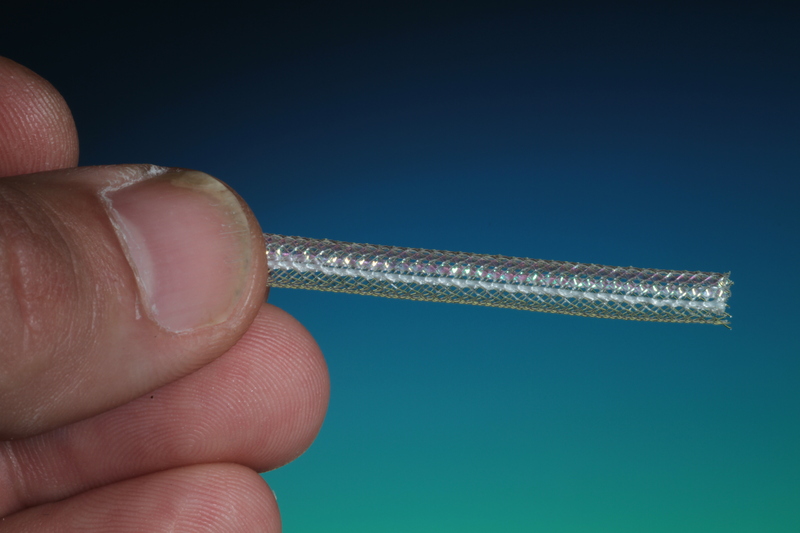 Take a length of medium E-Z Body tubing about 6-7-cm long. 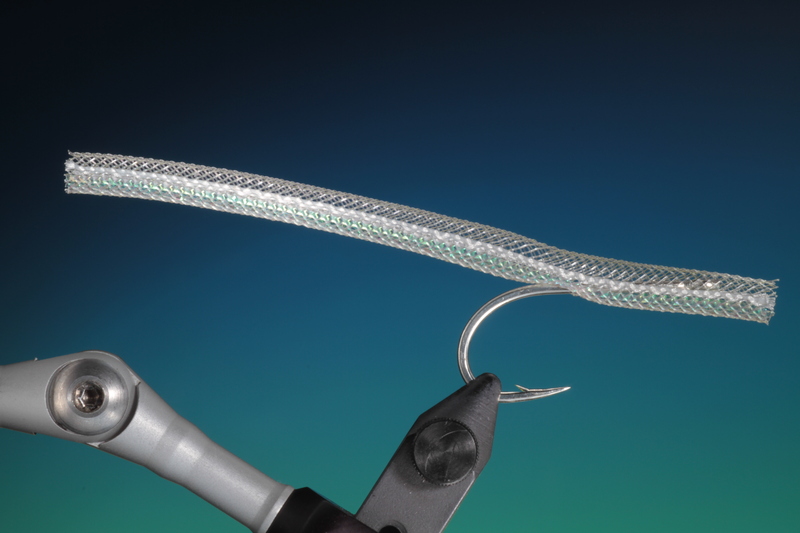 Measure the the tubing along the hook shank, so that you know where to insert the hook eye into the tube. 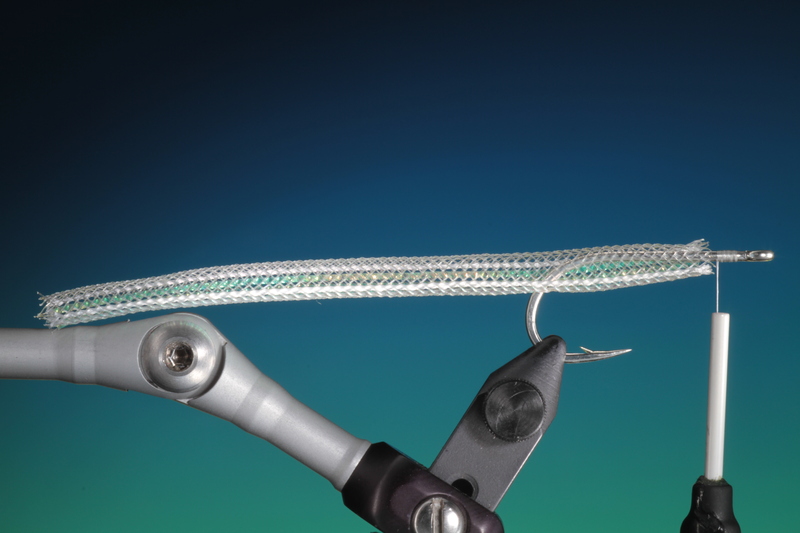 Make a opening in the tube where you are going to thread it onto the hook shank. 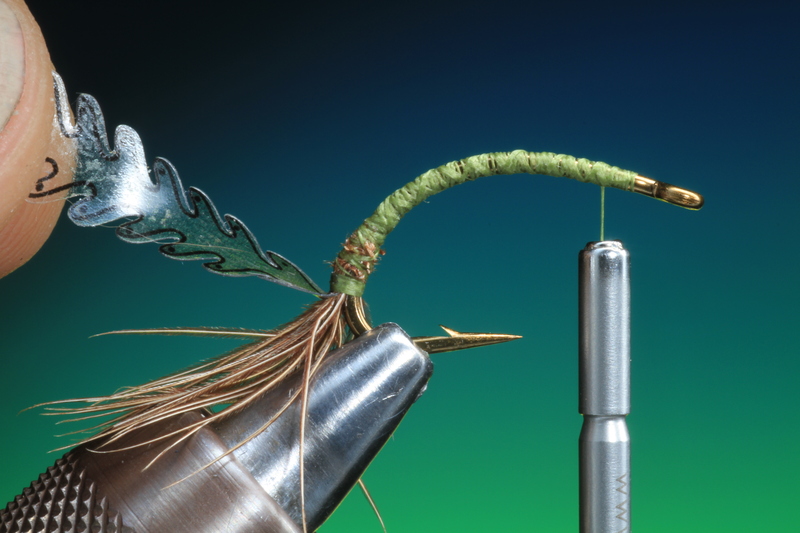 Thread the tube onto your hook as shown. 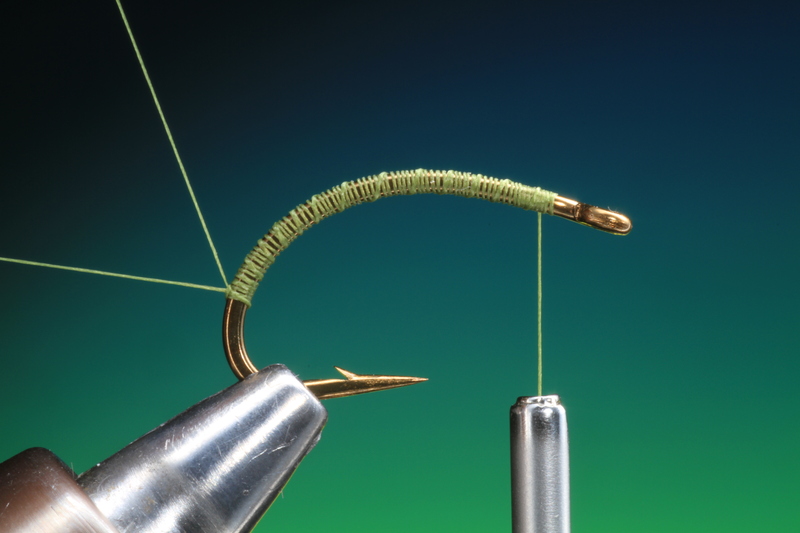 Slide the tube back and attach your tying thread behind the hook eye. 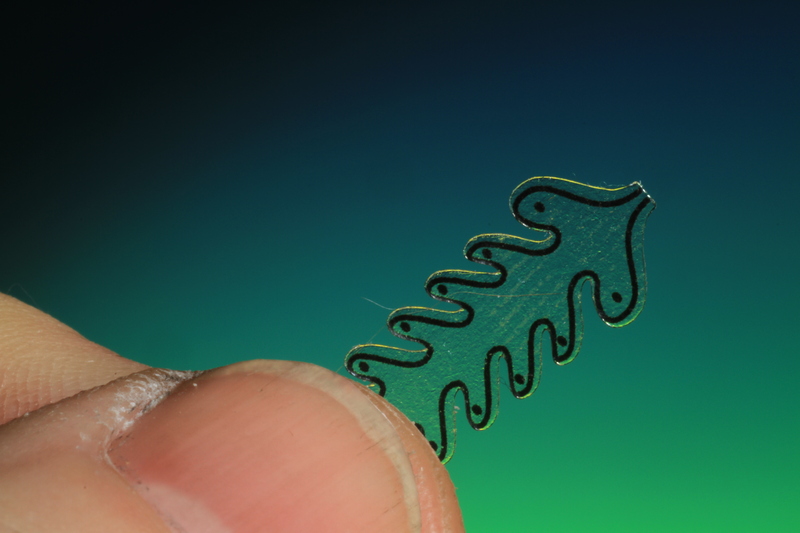 Thread a long loop of mono through the E-Z body tube towards the tail. 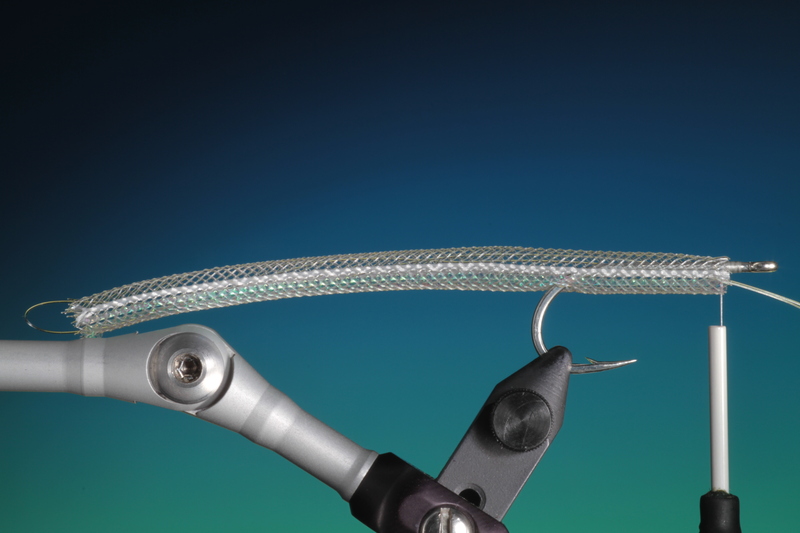 Thread the bunch of Flashabou through the mono loop and pull this through the tube and out at the hook eye. Tie down the Flashabou just behind the hook eye. 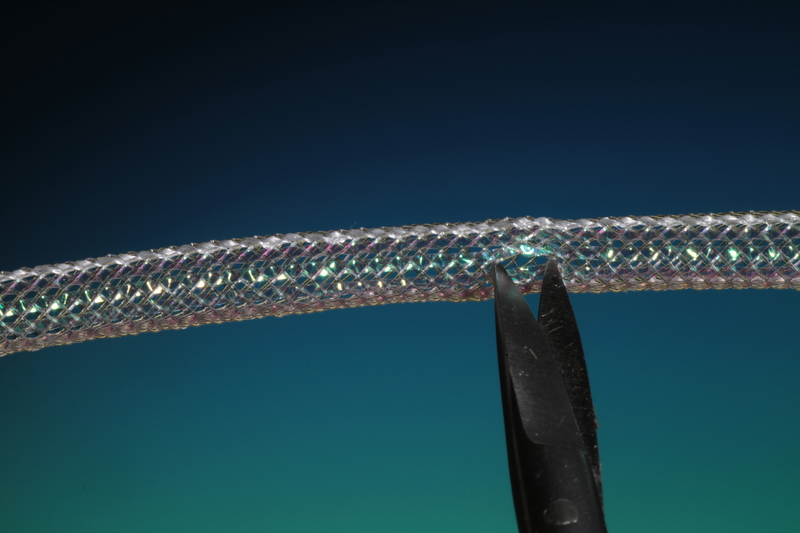 Tie in the end of the tube and make a neat tight head. 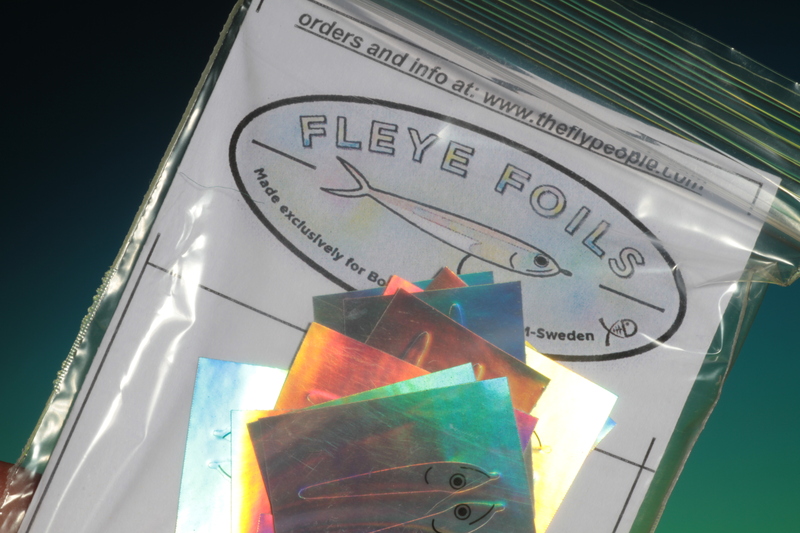 Select your chosen Fleye Foil product. I have used small 25 mm. 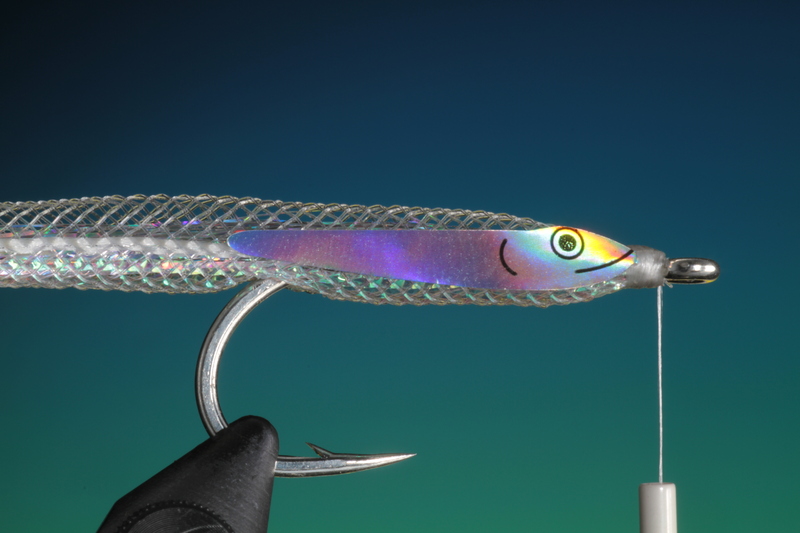 sand eel foils. 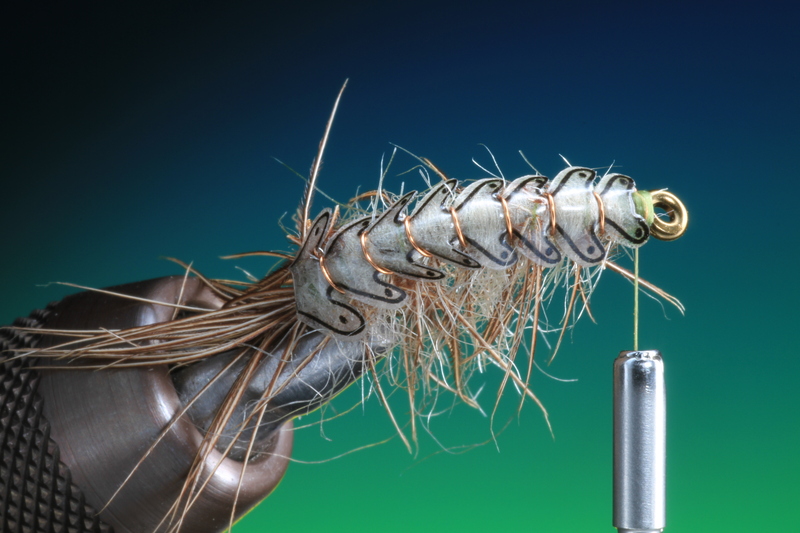 Remove the Fleye Foils from there card and stick them in place, one each side of the eel head and tie down using the small attachment on the foils. 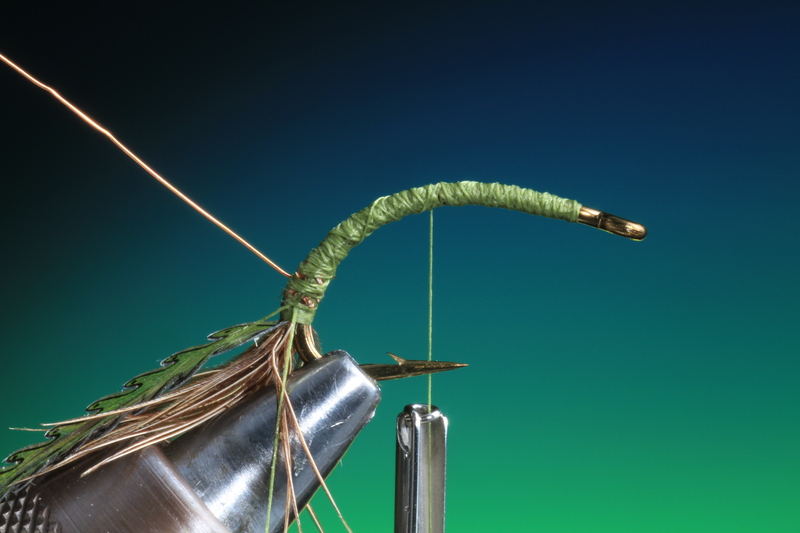 Once you have whip finished and removed your tying thread, turn your fly in the vice so you can tie down the tail at the base of the E-Z body tube. Once secure give it a small drop of Bug Bond just to hold it in place. 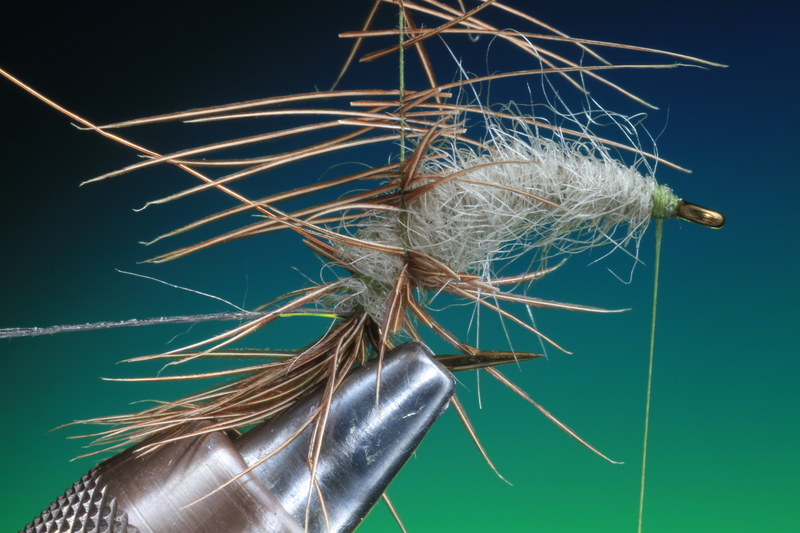 Remove tying thread and reset hook the correct way in the vice. The sand eel should now look like this. You can trim the Flashabou tail down to your required size and shape. You can now colour your sand eel if wished with water proof felt markers. 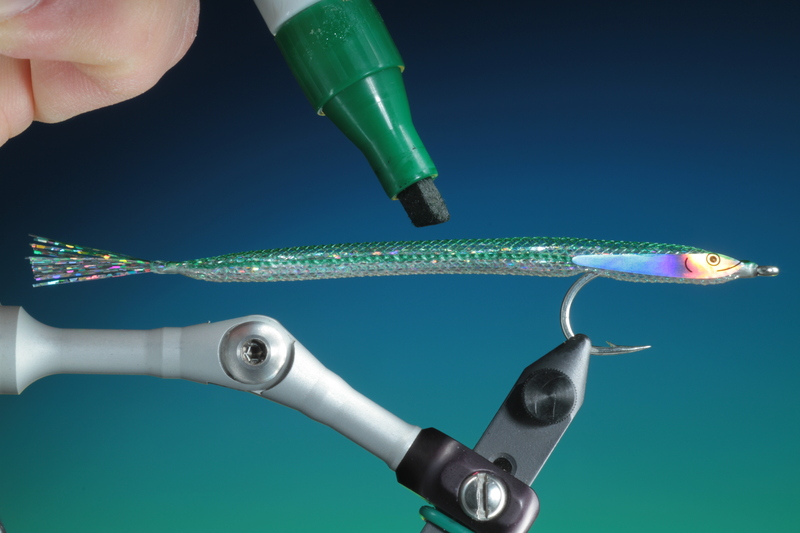 Carefully coat the foils and head of the eel with Bug Bond and cure with the UV light as you go. If you want a more three dimentional effect make small colour ajustments with felt pens after every coat of Bug Bond. 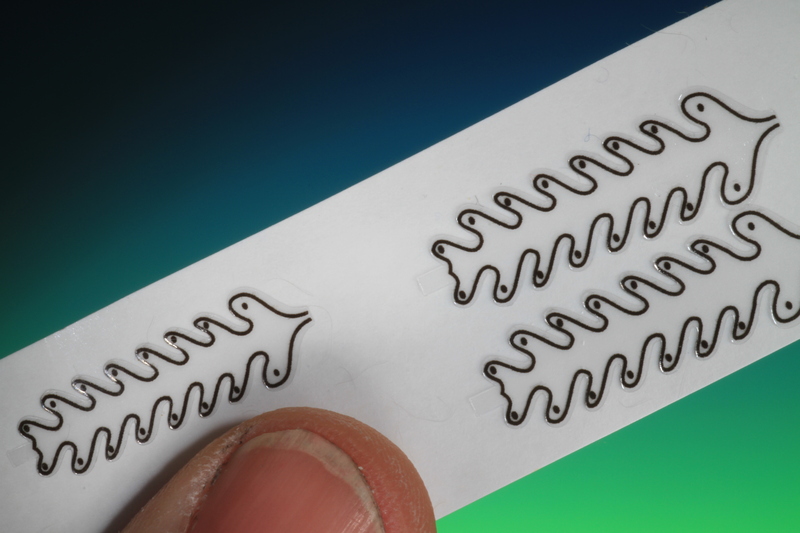 This builds up layers and gives more depth. If you ‘open’ the tail of Flashabou and place a tiny drop of Bug Bond at the base and cure! the tail will remain flaired and open. 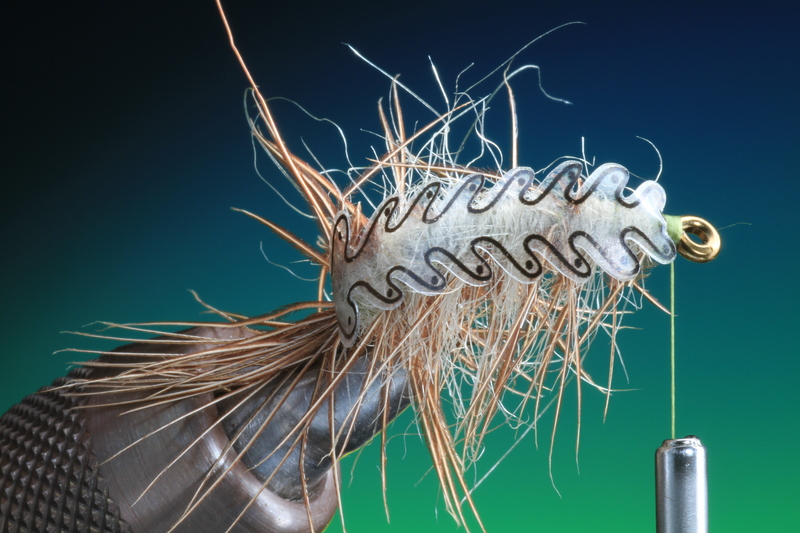 One of the great things about E-Z body tube is that it remains flexible.